now on taking ANY other lessons you and Ret are giving ANYWHERE. * Our teaching method: in addition to teaching steps and moves, we focus extensively on partnering dynamics - and fun! This graceful dance is always in style. 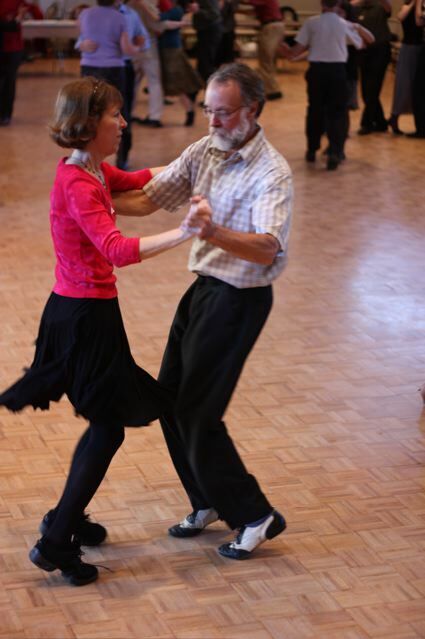 Learn the fundamentals --footwork, partnering, leading and following-- and we’ll include lots of flourishes, as well as teaching the Rotary Waltz style. For beginners as well as those who wish to improve their technique and partnering skills, and add variety to their waltzing. Experienced dancers are welcome to join from the start, or later in the month. Basics of East Coast Swing will be covered, and then we'll swing it to the next level! Add some fun moves to your repertoire. The emphasis is on partnering technique & musicality (interpreting the music), as well as moves and style. Experienced dancers are welcome to join from the start, or later in the month if desired. This series started in January, and may be joined by intermediate swing level dancers. The concentration will be on both East Coast and Lindy patterns. A portion of each class will be on blues rhythms. Get the feel for these cool rhythms while building partnering skills and repertoire. We'll be focussing on technique and steps. This series started in January-- intermediate level dancers can join us. The American style tango (AKA social tango) is pretty much the original tango as it was danced in Argentina a century ago. It is more accessible (easier to learn) then the present day Argentine Tango. It's a wonderfully fun and creative dance. We'll start with the basics as needed before teaching lots of interesting flourishes and moves.